The India-China relationship has always been too complex to classify under a single theme. Competition-cooperation-discord is an often-evoked term typology that reflects the contradictory nature of this relationship. Last year witnessed all these facets play out: India’s trenchant critique of the Belt and Road Initiative (BRI), India’s entry into the Shanghai Cooperation Organisation, the dramatic crisis in Doklam on the northern frontiers, the acceleration of multilateral cooperation in the BRICS format, and attempts to foster economic engagement. Yet, nothing exemplified the state of ties more than the Himalayan standoff, which was the closest both countries came to drawing blood in over three decades. What led to this tailspin in India-China relations? We will not find the clues in some valley or a narrow stretch of road in the upper Himalayas. Rather, the main reason has been a systematic buildup of negative images of how each side viewed the other’s foreign policies along with a collapse in geopolitical trust. For India, China’s attempt to raise its economic and political profile in the subcontinent was seen as an encroachment on, and an affront to, Indian authority in the neighbourhood. For China, India’s pursuit of deeper military engagement with the former’s main strategic rivals — the U.S. and Japan — was viewed as a serious challenge to its future security. Convinced that only an assertive policy would work, both Delhi and Beijing over the past two years began exploiting leveragesand pressure points to keep the other side off balance. India tilted closer to the U.S., China towards Pakistan, and on a scale not witnessed even during the Cold War years. Yet, neither side has been able to extract any concessions or improve the terms of their bilateral interactions. On a range of issues – the Nuclear Suppliers Group membership, Pakistan-sponsored terror and hydrological cooperation being the most prominent — India failed to receive any give from China. With India’s boycott of the BRI, China too found itself confronting not only the only major holdout against its flagship international initiative but also its most suspicious and non-cooperative neighbour in Asia. Beijing also noticed that New Delhi was beginning to openly involve external powers to collaborate with it in an anti-China strategy in South Asia and the Indian Ocean. Worse still must have been the spectacle of India brandishing its Tibet card. Such unbridled competition and rising costs to Indian and Chinese interests — and Doklam was the tipping point — appears to have persuaded both Prime Minister Narendra Modi and Chinese President Xi Jinping that their policies were producing zero-sum outcomes and required some kind of a course correction. Sensibly, both leaderships have drawn the correct lessons and are reciprocating each other’s moves towards a reset. 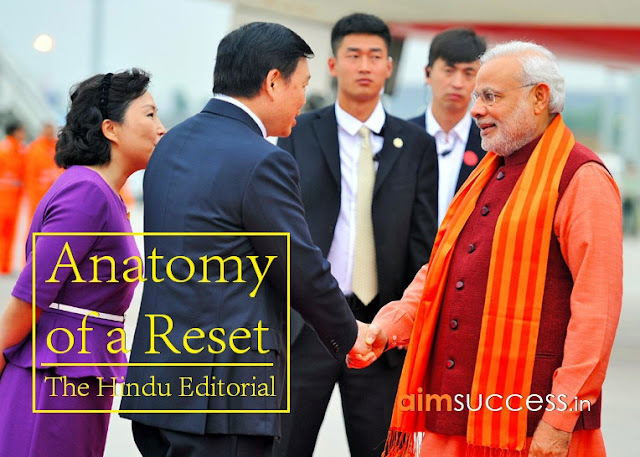 The traditional template, where India-China differences were handled in an overall framework of a politically stable and mature relationship, is being restored. The rhetoric from the recent meeting between Foreign Minister Sushma Swaraj and Chinese State Councillor and Foreign Minister Wang Yi was instructive. The emphasis has shifted from a glass half-empty narrative to a glass half-full: “our commonalities outweigh our differences” (Indian Foreign Minister) or “our common interests far outweigh our differences” (Chinese Foreign Minister). To be sure, we have heard similar rhetoric before. But the context is new as both leaderships hope to infuse stability back into this complex relationship. The Modi government’s decision to resuscitate the China relationship has aroused scepticism from the doubters in the strategic community who think the pendulum will shift towards appeasement after a period of doggedlystanding up to China. But New Delhi is really adjusting a policy that has simply not worked. First, it is becoming apparent to the realists inside the government that an adversarial relationship with China brings no advantages and amplifies security problems that India can neither solve on its own nor address with the assistance of external powers who have shown little inclination to deflect Chinese influence in the subcontinent and its littoral. Second, India-China friction enhances Pakistan’s ability to shape Beijing’s South Asia hand even though the latter itself would prefer a more balanced regional posture and a constructive equation with New Delhi. Third, a contentious India-China relationship also reduces India’s bargaining leverage vis-à-vis the U.S. and Japan. New Delhi must have also noticed that despite their differences with Beijing, both the U.S. and Japan truly value their interdependence with China. Sino-American cooperation on the Korean nuclear question and efforts to transform North East Asian geopolitics is just one example. Japan, with a $300 billion trading relationship with China, too wants to ensure it remains engaged with the world’s second largest economy. Recently, Tokyo has even endorsed the prospect of a “case-by-case” cooperation with the BRI. Finally, the Modi government is also recognising that the promise of economic cooperation with China can only translate into meaningful outcomes if there is overall geopolitical stability. Few economic actors will enter the frayif the forecast for bilateral ties is one of uncertainty and turbulence. Mr. Modi’s original instinct to craft a grand “developmental partnership” with China got lost in the geopolitical headwinds after 2014. There now seems to be an effort to reclaim that pragmatic vision. Since 2014, India’s discourse on China’s rise has swung back and forth from paranoia and deep suspicion to calmer assessments of its implications for Asia and the world economy. Fortunately, there is now a shared belief in both capitals that a posture of hostility has undermined Indian and Chinese interests. But an India-China détentewill have to be built on more than just common sense. Mr. Modi and Mr. Xi have their task cut out for them. Meaning: Invoke (a spirit or deity). Meaning: Be a typical example of. Meaning: Become increasingly chaotic and out of control. Meaning: Intrusion on a person’s territory, rights, etc. Meaning: An action or remark that causes outrage or offence. Meaning: An activity of a specified kind, especially a recreational or sporting one. Meaning: Having or showing a confident and forceful personality. Meaning: Make full use of and derive benefit from (a resource). Meaning: Use borrowed capital for (an investment), expecting the profits made to be greater than the interest payable. Meaning: A punitive ban on relations with other bodies, cooperation with a policy, or the handling of goods. Meaning: Face up to and deal with (a problem or difficulty). Meaning: Having or showing a cautious distrust of someone or something. Meaning: An event or scene regarded in terms of its visual impact. Meaning: Wave or flourish (something, especially a weapon) as a threat or in anger or excitement. Meaning: Special importance, value, or prominence given to something. Meaning: Make (something) active or vigorous again. Meaning: Evoke or awaken (a feeling, emotion, or response). Meaning: In a manner that shows tenacity and grim persistence. Meaning: An interest in or liking for (something). Meaning: Relating to or situated on the shore of the sea or a lake. Meaning: The dependence of two or more people or things on each other. Meaning: Recommend (a product) in an advertisement. Meaning: A state of conflict or confusion. Meaning: A natural propensity or skill of a specified kind. Meaning: A wind blowing from directly in front, opposing forward motion. Meaning: Dealing with things sensibly and realistically in a way that is based on practical rather than theoretical considerations. Meaning: Unjustified suspicion and mistrust of other people.